2004 A Retrospective: Desert Paintings 1988-2002 Creators Artspace Wodonga. Victoria. 2005 A Studio in Umbria-Drawings from the Sketchbook, Italy. Beehive Artspace, Albury. 2010 Muse Gallery Milawa. 'A View from Above' paintings after the fires. 2018 Carpe Diem. Collages, Pages from the Diaries. Old Beechworth Gaol. 1977 Selected. International Hasselblad Masters Travelling Photography Exhibition. 1979 Joint show (4 Artists from Alice). The Residency, Alice Springs. 1983 Museums and Art Galleries of the NT. Alice Springs. 1990 Amnesty International Show, Framed Gallery Darwin. 1998 St Stephan’s Art Exhibition Melbourne Victoria. 2014 Alice Springs Craft Council group show. 2004 Painting commissioned by the Australian Golf Union. Moonah Links, Victoria. 1997 Selected. Wodonga Hume Building Award. 2009 Commission. Strathewen Community- Bush Fire Painting. 2009 Highly Commended. Wodonga Hume Building Award. Various commissions for institutions and private collectors. Alan graduated in Industrial Design from R.M.I.T. in 1969, and in his the final year won the Sebel Design Award. For the next two years Alan worked for a consultant graphic designer in Melbourne. In 1970 he trained as an Art Teacher before taking up a teaching position in Alice Springs in the Northern Territory. Alan lived in the Alice for ten years teaching Art at an Aboriginal College. 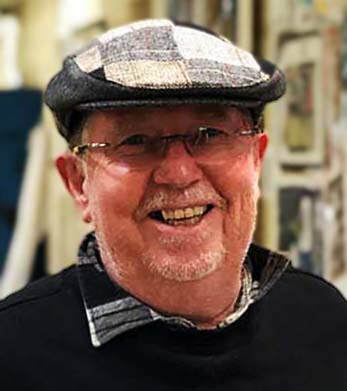 In 1985, Alan moved to Darwin and from 1991 to 2000, worked as the Director in charge of Public Relations and the Print and Publications Unit for the Northern Territory Department of Education. In 1998 Alan took 3 months leave and traveled extensively throughout Europe. After leaving the Public Service in 2002, Alan started his own publishing, art/ Investment consultancy and divided his time between publishing duties and painting in his Darwin studio. In 2003 Alan and his wife sold their Darwin house and studio and returned to Italy to live and work. Alan completed a major body of work whilst living in Umbria particularly concentrating on the landscape and the surrounding hill top towns. After returning from Europe, Alan moved to Beechworth where he built a house and studio on 18 acres of natural bush. He is presently working on his third book about the history of Florence concentrating on the 13th-14th Century. Alan also teaches drawing classes on a regular basis and conducts weekend retreats on landscape painting and drawing for beginning and experienced artists. Alan has journeyed long to reach his current destination. The genesis for his paintings comes from, and is rooted in the deserts of central Australia. The wide open spaces littered with spinifex and long languid sand dunes stretching to the horizon spoke to him of a timeless landscape. Something happened there, which resonated with him and so changed his view of the land forever. His first encounter with this ancient land brought about a perception of the bush that has not ceased to excite him some 40 years later. He works with oil paint often making sketches on site. Alan has been represented over the years in galleries in Melbourne, Darwin, Armidale and the Gold Coast. His work is in the permanent collection at Araluen Art Gallery in Alice Springs and private institutions and company boardrooms across Victoria. He is currently represented by Off Centre Galley and Studio in NE Victoria.